Gemini IV capsule on display in the Museum in Washington, DC. Gemini IV astronaut Ed White completed the first U.S. spacewalk on June 3, 1965. The Gemini IV mission lasted four days—the first long-duration mission for the US. The Gemini program kept enthusiasm for the space race high during the mid-1960s. Gemini astronauts took beautiful color photographs of the Earth as they orbited. The clarity and beauty of these photos were an unforeseen benefit of the Gemini program. Images of the Earth from space continue to inspire astronauts and Earth-bound humans alike. Gemini IV spacecraft on display in the Boeing Milestones of Flight Hall. The Gemini IV spacecraft featured two seats in a cramped space. Edward H. White II became the first American to perform an Extra Vehicular Activity (EVA) or "spacewalk" from the Gemini IV spacecraft on June 3, 1965. 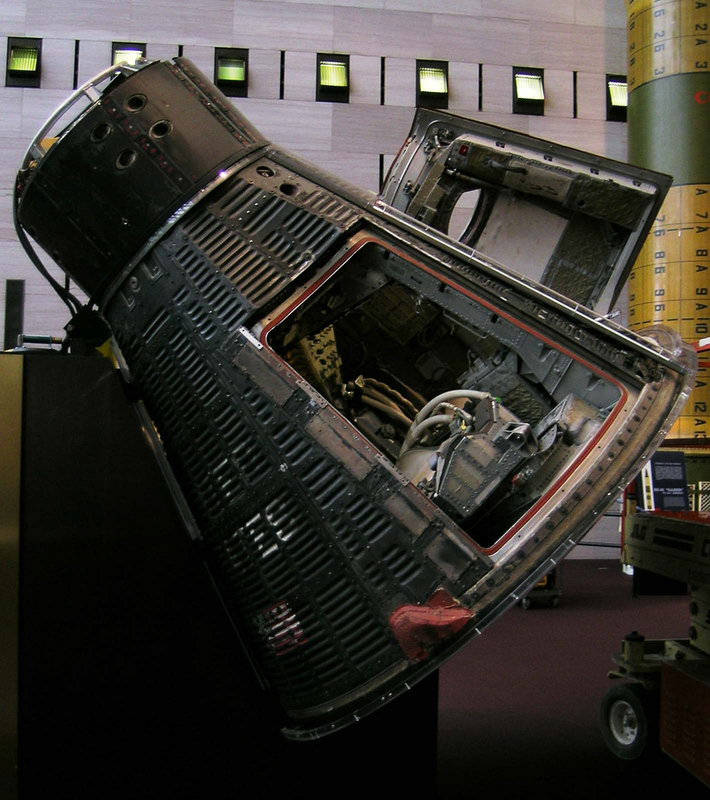 This image shows Gemini IV as it was formerly displayed in the Boeing Milestones of Flight Hall at the Museum in Washington,DC. The spacesuits have been removed. Gemini IV achieved the first American spacewalk, a major step toward living and working in space. On June 3, 1965, a Titan II rocket launched this spacecraft, Gemini IV, carrying astronauts James McDivitt and Edward White into orbit. The flight lasted four days and included a historic space walk by White, the first by an American, early in the mission. Ten weeks earlier, Soviet cosmonaut Alexei Leonov had become the first human to "walk in space." NASA broadcast the audio from White's 22-minute "extra-vehicular activity" (EVA) live; he enormously enjoyed the experience. The flight plan also included a rendezvous with the discarded second stage of the Titan II rocket. It was aborted, however, after pilot Jim McDivitt experienced unexpected difficulties reaching the booster because he had not been properly trained in rendezvous techniques. Other experiments during this flight included Earth photography, space radiation measurements, and medical effects of prolonged weightlessness. In 1967 NASA transferred the spacecraft to the Smithsonian. Why was it called Gemini? Hint: notice the two seats. The two-person Gemini spacecraft was built by McDonnell-Douglas and was of the same basic design as the one-person Mercury capsule.